I love these! If you have any kind of pet with hair this is so perfect. My horse Sinatra already gets a lot of grooming and TLC but these are such an easy fast way to de-shed him. And they're especially perfect for cold winter days when my fingers are practically numb. My dog Sampson doesn't really shed but I know he'd probably love the attention - at least for a little while! And I fostered so many cats and kittens over the years. This would have made it so easy to brush them. None of them liked brushes too much but they all loved to be petted. So many uses! 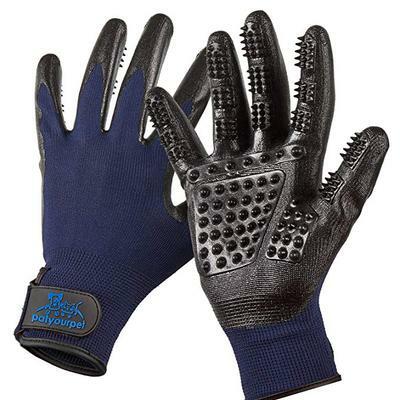 This glove is designed to remove pet hair and tangles. They have rubber tips so you're brushing and massaging. And...they have a money-back guarantee. Great gift for any animal lover! Return to Share Your Favorite Horse Stocking Stuffers!.